Once upon a time I had a hankering for spaghetti squash. I know, I sound crazy. Who on God’s green earth craves spaghetti squash?! Real spaghetti, maybe. Squashy wannabe spaghetti, hellz nah. Well it all started with a can of fire roasted tomatoes. Blame in on the tomaters. The rest is heeeestory! Remember that one time when everyone was in a low-carb-paleo-grain-free-gluten-hating phase? Oh ya, that’s right now. Spaghetti squash is TRENDING. Let me begin by confessing that I never eat spaghetti squash. It’s like olives and eggplant and okra. I’m totally into them, but I never really cook them at home. 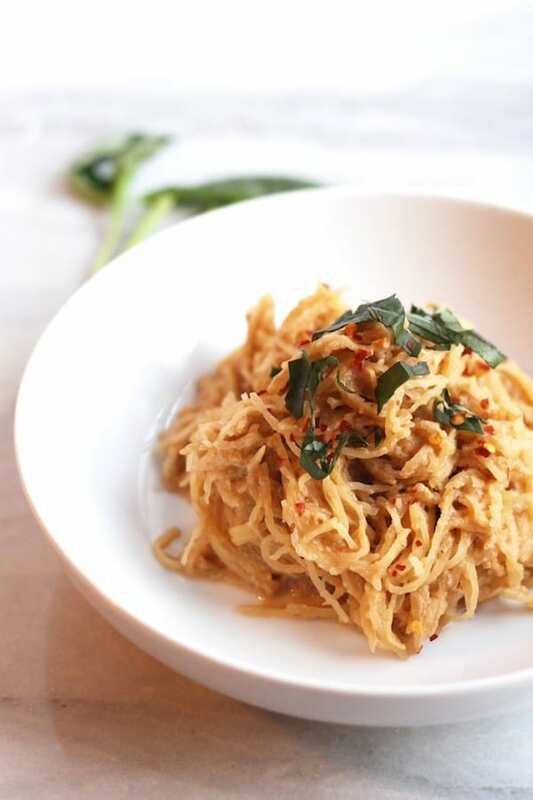 Spaghetti squash is kind of stringy and weird and it may look like noodles, but it sure doesn’t taste noodles. I smell some identity issues here. The good thing is that since it doesn’t really taste like much of anything, it takes on whatever sassy sauce you feel like slathering it in. This, my friends, is one of the simplest, tastiest, most humbelievable recipes I ever did post. This recipe is E-A-S-Y. Exquisitely, Adoringly, Satisfyingly, Yumtastical. I’m still kind of shocked about how incredibly creamy and flavorful it turned out, but I’ve learned from experience that cashews make dreams come true so I really shouldn’t be so surprised. You could easily use whole grain pasta if you’re not feeling spaghetti squash. I think some sautéed spinach or kale or roasted tomatoes would be a delish addition as well. Alllll the green veggies for this exciting month of January! Please faceplant into a bowl of this and call it dinner. Thanks. Preheat oven to 375F. 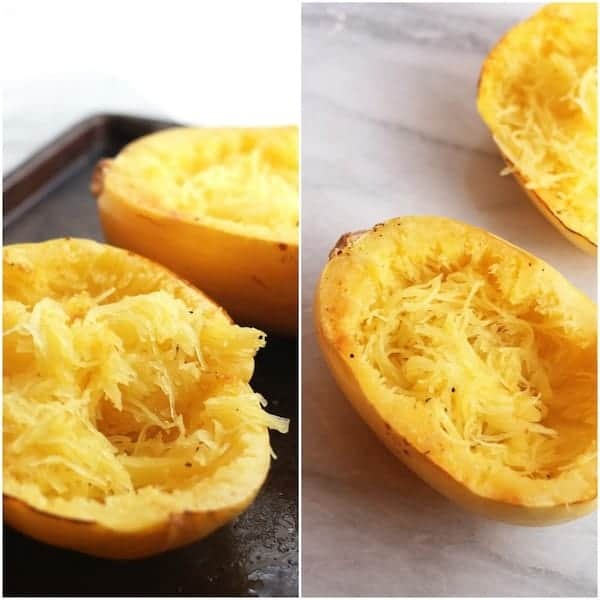 Slice spaghetti squash in half. Scoop out seeds and stringy flesh with a spoon. Rub a teaspoon of olive oil over each half (inside, not outside). Rub with garlic and sprinkle with salt and pepper. Place face down on a baking sheet and bake for 35 minutes. Meanwhile, place the sauce ingredients in a blender and blend until completely smooth and creamy. Set aside. Use a fork to shred the spaghetti squash into strands. Heat a pan over medium heat. Place squash in a pan and cover with sauce (I used about 2/3 of the sauce and saved the rest). Toss to combine until warmed through. Top with fresh basil and red pepper flakes prior to serving. I am NOT a fan of spaghetti squash (also because they are like $20000 each here) but damn..your pictures are incredible, I’d eat it and ask for more, a la oliver twist. Literally LOLed at that Oliver Twist reference. I just made this tonight and it was soooooooooo good! So creamy without the calories of heavy cream or cheese with no nutty flavor at all. YUM- this sauce looks like heaven especially as I’m trying to stay away from dairy for now, cheese is off limits. This looks like the perfect substitute. Going to try it with zucchini noodles :)! Mmmm love the thought of it with zucchini noodles! Gaaah! This looks incredible. Loving the small ingredient list and quick prep time!! Thanks, Maryea! I’m trying to focus on simplicity, mainly because I’ve been so lazy! Thanks, June! It’s my new favorite. Ok this is making me so jealous that I can’t eat cashews! Truth be told I don’t cook spaghetti squash for myself that much either. I haven’t even bought it once yet this winter! No cashews? Oh dearrrr :/ Maybe try cauli puree and some nooch? I just want the whole lot of it in my facetrap rightnow! Cuh-reamy dairy-less ‘mater sauce? I die! I die a hundred ways. Facetrap is my new favorite word. I love spaghetti squash! This looks YUM! Haha I want to come over and eat your Italian mom’s pasta!!! Eeee perfect timing! I bought a spaghetti squash and I immediately regretted it only because I’m bored out of my mind of my usual recipes for it. Can’t wait to make this! Perfect! It can definitely get kind of boring, so here’s the perfect excuse to change it up! I think I’m in love…making this asap! I looooove spaghetti squash! I don’t make often enough either, though! You’re so right about it being trending. My one recipe with spaghetti squash is always one of my most popular! Isn’t that funny how certain foods get so popular?! You scoop out the seeds before you bake and throw them away. Then you rub oil on the inside. Hope that helps! This looks SO good!! 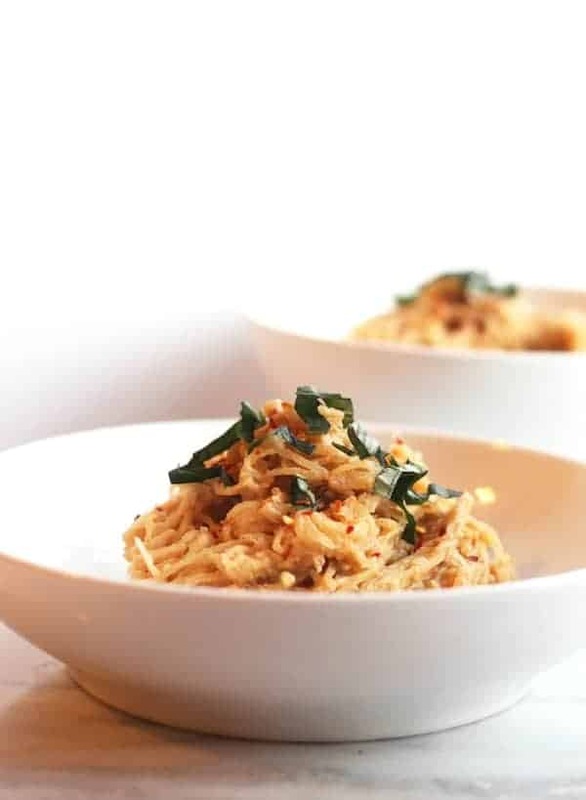 I’m always looking for ways to jazz up spaghetti squash – can’t wait to try this. Would a food processor work for making the sauce? My blender is not super powerful. Hmmm it should work, just make sure that the cashews are blended up super smooth. I like spaghetti squash- mostly because I get to eat a giant bowl of “pasta”. So does the sauce have a nutty taste at all? Nope, no nutty taste at all! That’s the great thing about raw cashews–they’re so mild in flavor. Yummtastical — stealing it <3 And can you believe that I've never died spaghetti squash? I came close once, but the thing ended up sitting in my kitchen for so long, that when I finally went to cut it open, it was all sprouty with little alien arms on the inside so I threw it away. Maaaaaybe this year will be my year. Cashews really do make dreams come true. This looks absolutely scrumptious and I love how simple the sauce is. Oh, and gorgeous photography too. Nice work, lady! I totallllly think I have those tomatoes in my pantry. Or at least I’m hoping I do because I want to make this tomorrow for lunch this week!! Those tomatoes are something I always keep in the pantry….thank God! Ohh this looks delicious! They were out of spaghetti squash at the store the other day, but when they have it again I’m definitely going to make this! Unfortunately the cashews are what gives it that creamy texture :/ Maybe pureed cauliflower and some nutritional yeast? It won’t be very creamy, though. Hi there. If you puree steamed cauliflower (add garlic in the water if you like) in a blender with some stock it gets very creamy (made some last night). Adding the nutritional yeast will give it a cheesey flavour too. Maybe tofu for the creamy texture? Made this tonight– soooo yummmmmy!! Thank you for another amazing meal, Alexis! Yayy! I’m so glad you tried it and liked it, Sara! So dreamy and creamyyyy! Um, I am loving every bite. I kinda want to just eat the sauce. But I’ll add my squash…ya know, just to round out the meal. Hahah I know right?! You won’t be judged if you just eat all the sauce. My wife and I absolutely LOVE the look of this recipe! Especially the fire roasted tomato cream sauce (yes, please!) I USUALLY am not a fan of most things tomato (I know, it’s surprising why I haven’t been thrown to the tomato firing squad) BUT I am most definitely tempted to give this recipe a try. Thanks for sharing! FIVE STARS for you! Why? Cause this blog, this recipe, it’s all gorgeous! Totally Random Note: My wife and I actually met Arman (commenter above) in Melbourne a few months back. Just another example of food blogging transposed onto REALITY! Hey Arman! This looks amazing! I follow a high carb low fat plant based diet so I’ll definitely be having this with pasta instead of spaghetti squash! I’m trying this tonight! Yum. Yesss–go for the real deal! I basically doubled the recipe and it made plenty for 1lb cooked linguine. Baked a chicken breast for the meat eater while us two vegans had sauteed mushrooms and fava beans on top. It was delicious! Thanks for the great recipe! Hi Michelle, sorry I don’t calculate nutrition info. Feel free to use the recipe calculator on sparkrecipes.com! You, madam, are an absolute genius. What a perfect dinner to whip up after work. If ya make the squahs ahead of time this would take like 5 seconds to prepare… amazing. Gonna try it this week for sure! Also, new reader here! I LOVE your blog and have been stalking it for the past few evenings. Hah. Although the one bad thing is I can no longer digest beans (seriously suckish as a long-term vegan) and all your posts about hummus make me miss the good ole days of eating hummus with every. single. thing every day! Made this last night on a whim and not only was it super easy, it’s amazing (eating leftovers for lunch right now)!!! I did add spinach and mushrooms, too, which helped bulk up the veggie ratio. I love all of your stuff! Hi! I know this recipe is a year old, but I found it on your blog and can’t wait to make it :). Question: do I drain the cab or tomatoes first or just dump it all in my blender? Also, my husband is a meat and potatoes kind of guy (it’s unfortunate) – do you think it would be good with some chicken throw in for him? Thanks! Ahhhh, I made this for dinner tonight for the first time…SO GOOD! Thank you so much for this easy and healthy recipe. :) I have so much sauce and squash left so I can’t wait to use this for my lunches for the next few days! This recipe has been a big hit here. I’d say that the red pepper flakes are a must and shouldn’t be optional! Thanks for the recipe! I decided to turn this into a casserole.It was delicious and so healthy! I prepared 2 squash as directed then put them in a casserole dish. I mixed with the sauce (1 recipes of sauce worked fine for 2 squash), covered and popped in the oven to warm. Definitely use FRESH basil and don’t skimp on the pepper flakes. On day 2, I mixed in some fresh pan roared broccoli and pine nuts. I liked it even better the second day. The pine nuts added flavor and crunch, and the broccoli tastes great with the Italian flavors. I’d serve to company! That sounds incredible!!! You rock!! Made this last night for dinner and it was excellent. As I cut open My spaghetti squash , I realized it was rotten on one side (grrrr), so I spun up some zucchini “noodles “to make up for the loss, and that was great tossed in those as well! Looking forward to leftovers for lunch. Thanks for the recipe! You’re so welcome! Loved that you used zoodles. This looks delicious! I love spaghetti squash! The one though that you did that made me cringe is the way you cut the squash in half. I read a great blog post about how doing this cuts all the “noodles” in half, making them way shorter. The trick is to cut the squash in rounds, going with the “grain” of the tendrils. With this method, your noodles are twice as long and even more spaghetti like! After roasting, just use a fork to gently pull the tendrils away from the skin. Can’t wait to give this recipe a shot! Just embarked on a paleo diet. I have literally never tried spaghetti squash because… well i just ate regular spaghetti(<3 carbs). Tomorrow i am making this for dinner, basically because this post was hilarious so I have no reason to doubt a hilarious person. It will be amazing. Amazing! Cashews are so incredible. My latest Buffalo Cauliflower Dip has cashews too, give it a whirl! The sauce is amazing, and so simple! I’m not a spaghetti squash fan, but I was intrigued by the sauce recipe so I made it and used it in 3 separate dishes (I’m a single vegan household). The first night I put it over some butternut squash that was pre-cut into rotelle pasta shapes, that I found at Trader Joe’s. Delish! The second night I added it to sauteed onions, garlic, mushrooms and spinach and tossed it over pasta. So good! Today I had it for lunch. I sauteed onion, garlic, mushrooms, red bell pepper, spinach, and tiny tri-colored potatoes (which I’d boiled the previous day. When the saute was done, I added the sauce to the pan to heat. Really good! I will make this sauce again and again. Thanks so much! What a delicious recipe! Thank you. I didn’t have fresh basil on hand, so I used a combination of fresh parsley & baby spinach. Also added some additional spices to the sauce ….allspice, marjoram & a bit of dried oregano. I’ll certainly make this again!!! Love the swaps! Its so creamy and delicious it’s one of my faves. Hi! Would this keep as leftovers for the next day? I got a spaghetti squash on a whim at the market and have been googling recipies….. I’m short of the cashews but thought I can make it without the cashews then sprinkle it with almond Parmesan instead (i usually mix ground almond with salt and maybe some nooch if i have it). WOW it looks delicious, yummy. Yay! Love the shallot addition! This might be a silly question, but I am going to make this tonight and I am wondering if I use the diced tomatoes and juices or drain the juice and just use the tomatoes? Thanks! What a delicious recipe! So creative! I am making this now. First time making cashew cream with tomatoes instead of water- great idea! I was out of basil so I used 2 cloves of garlic instead. Thanks for sharing this recipe. Hey Alexis ! This is a fave! Can you freeze the sauce ? I made this today just as written. This is the first recipe I’ve made using raw cashews. I am amazed at how flavorful and creamy the sauce is! Thanks for the recipe! Making this tomorrow. How long can leftovers stay in ‘fridge?